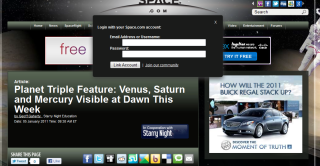 This screenshot shows the the login process for SPACE.com's new community and comments system. So you've found something juicy on the new SPACE.com and are just chomping at the bit to jump into the discussion with comments to steer the conversation in our Forums. Now that we've got a new design, there's a few ways for readers to participate and discuss the latest space news of the day. The first way for readers to log in to SPACE.com's community services starts at the top right corner of the page. There, you'll see some icons for popular social media services like Facebook, Twitter, Yahoo and others. Returning SPACE.com fans can link their existing SPACE.com community accounts with their social media interface of preference here. To do that, first pick your social media service of preference and login in. A window will pop up that asks for your SPACE.com log in and password. Once that's complete, you should be all set to start commenting on stories or posting discussions in the forum. A note: If you'd like to post comments to new stories and articles, you will need to link your SPACE.com accounts with a social media service. Another way to join the conversation is to join our forums directly. You'll see a link for that at the top right corner as well called "Join our community." That will take you straight to a sign up form that should get you started to jump into the cosmic fray in our digital salon that is our space forum community. This method, however, applies specifically to the forums and not for commenting on stories or other features. Log in with your preferred social media service and link your SPACE.com username and password with that service. Finally, just log in using social media only. I hope this primer helps returning SPACE.com readers and new users alike take advantage of the best our new design has to offer. We look forward to hearing your thoughts and comments, and – as always – promise to bring you Something Amazing Every Day.